In these 6 months, January - June 2014, most of the technological choices and many of the market choices facing the autonomous vehicle industry have been explored here. See also: Driverless Cars 2013 for the full previous year. 2013 was a big year for driverless cars. We hope that in 2014 at least one manufacturer will have the courage to launch its prototype driverless car without a steering wheel, perhaps substituting emergency navigational joysticks within reach of both front and rear passengers instead and creating a true driverless car. We understand the main practical difficulty of this: highway authorities will not allow the cars on the road. (To overcome this we propose a particular village, town or city conducts a trial). Our assessment is that there are two large future market segments in the demand for driverless cars: 1) those who want the car to take over driving tasks when they no longer wish to undertake them and to simplify them otherwise and 2) those who want the car to do all the driving. We believe that both could be of comparable size and the latter will comprise a very substantial component of new sales for auto manufacturers. Where all occupants are passengers and not drivers it might be possible to also move to a no fault insurance system with passengers being compensated for injury and loss (as they would be when travelling on a railway) without being involved in the determination of fault. This video of a GM driverless car estimates the additional costs of driverless technology at $5000 - $7000 per vehicle. Solely electric motive power might double this but at $10,000 - $15,000 per vehicle there will be many willing to opt for safer, cleaner, driverless cars from the outset. We would also like to see the first cars for sale on what one might call a political timescale - three years - rather than subject to the over-cautious estimates of 2020. These technologies are ones where developed nations have first mover advantages. It has always been possible to design a building just using two-dimensional information. In other words without ever doing a perspective or axonometric drawing, building a model or, in more recent times, a computer simulation of the volumes. Plans, elevations and sections would suffice. This has been very much the predominant means of representing buildings for two millennia. In fact, I have the most admiration for those architects in history who achieved masterpieces using almost solely these, like Robert Adam, especially because in his case when you read from his drawings to what was built the correlation is very close whilst the correlation between perspective drawings and the reality tends to be loose. Modern laser-assisted surveying can be either two or three dimensional. This, of course, applies to laser-assisted automated navigation, too. Logically, architectural surfaces, principally elevations, should be much more important in position finding if you use two dimensional lidar for positional information than if you use three dimensional lidar and GPS for it. In that case, if you could build the town ab initio to accommodate driverless vehicles you could build in physical reference cues into elevations that could be used for very accurate position fixing and supplement them with street furniture that electronically fixed position too and provided supplementary navigational co-ordination data. In such a town you would not need GPS. On the multi-lane highway, platooning commercial vehicles could be given dedicated lanes that minimised the necessity to stop or brake, to save fuel, and this might alter rules of priority. The outer lane, rather than the inner lane might be used for commercial vehicles, too. As for bicycles, one idea currently in circulation is that each cycle would be fitted with GPS and a transmitter so that autonomous vehicles would be warned of its position, even in the dark. As cyclists might object to this, fitting autonomous vehicles with forward facing infrared sensors might be a better alternative, picking out pedestrians, cats, horses and cyclists - even in the dark. If you make the choice that a driverless car is not going to use GPS and triangulation from mobile phone masts as navigational aids, perhaps to substantially reduce the possibility of external hacking of navigational systems, what are you left with? Prior knowledge, machine learning, inertial systems, the road and its boundaries, road markings, street furniture and the built environment. Dealing mainly with the latter three, road markings are vital for navigation but do change from time to time for multiple reasons, or may be obscured or unreadable because it is dark, because of snow and ice, because of stationary public transport vehicles or turning articulated trucks, for instance. Street furniture could be adapted to give very accurate positional fixes and secure information exchange, including a local cue map. This could potentially reduce the amount prior knowledge that had to be carried onboard as well as the amount of machine learning. Buildings themselves could be designed to have physical cues, with very accurate positional coordinates, that could be read by a passing lidar and architecturally these could be designed so that they were always visible e.g. they glinted in the dark and were protected by architectural features that meant they were never obscured by snow. This would be particular useful if data exchange with street furniture was switched off. (GPS is accurate but not quite accurate enough on its own for the continuous navigational position fixing required so the search is on for even more accurate means of getting positional fixes in everyday environments, which can work alongside GPS or not). Why are the main road vehicles that are going to use autonomous driving technology likely to be cars at first? Why not delivery vehicles? For many reasons but one of them is the Robocop dilemma. You cannot programme in instructions for the robot to cut corners. The delivery van cannot mount the kerb. (Having said that an all-electric driverless van made a very long trip indeed from Parma to Shanghai in 2010). Driver assistance for commercial vehicles, like platooning, is a real medium term possibility but not full autonomy. The EU co-funded HAVEit programme, completed in 2011, trialled it as have Volvo for some time. Once you quit road space and use pedestrian space or discreet lanes then shuttles and pods play a role. This video of the Navia Cybergo shuttle explains the concept. The best known pod system is at Heathrow Terminal 5 and is used for access to and from the business parking areas. The concept of the central control of pods probably only lends itself well to a restricted radius of operation at present. The next step for pods is fully autonomous operation. (The Heathrow pods system, engineered by British companies including Arup, uses autonomous guidance technology but is not fully autonomous because the pods are confined within delineated routes and centrally controlled). 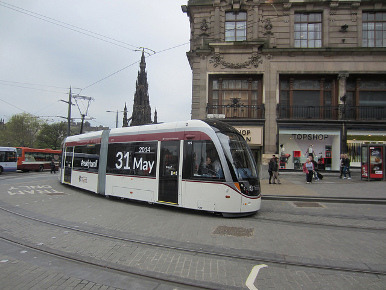 If you want to assist a lot of pedestrians get to an historic monument without allowing a lot of taxis and other internal combustion engined vehicles to get close, with the risk that they might run into it or that their exhaust fumes will degrade the building fabric, then electric autonomous pods are an excellent if currently expensive solution. A British engineered pod system is currently being designed for Amritsar. Mercedes-Benz appears to be very much in the school of having all the technology onboard and it is impressive. Much of it could autonomously drive the car now without waiting for 2020, the date so often touted as the start date for driverless cars going on sale. Despite the triumphal arches not looking correctly like triumphal arches I really like the graphics in these Mercedes simulation videos and isn't it good that most videos about autonomous vehicle technology appear first on independent channels and not on corporate websites? (The Draper Fisher Jurvetson model of viral communication is usually superior for new technologies). This is in tune with what they will do for society - democratise mobility further and the way business can be conducted. After the internet and jet travel, they could constitute the most democratising technological development of a lifetime. As you look outside and walk through parking lots and past multi-lane roads the transportation infrastructure dominates. Its a huge tax on the land. Most cars are used only for an hour or two a day. The rest of the time, theyre parked on the street or in driveways and garages. But if cars could drive themselves, there would be no need for most people to own them. A fleet of vehicles could operate as a personalized public transportation system, picking people up and dropping them off independently, waiting at parking lots between calls. Theyd be cheaper and more efficient than taxi - by some calculations, theyd use half the fuel and a fifth the road space of ordinary cars and far more flexible than buses or subways. Streets would clear, highways shrink, parking lots turn to parkland. Were not trying to fit into an existing business model. We are just on such a different planet. Exploring potential business models has been one of the most interesting aspects of looking at driverless cars in 2013. Developing some of them further is part of the tasks and offering of our new consultancy. Their number will grow as vehicles become available. Three strands are already clear. First there is the approach of having the best mapping, prior knowledge, machine learning and software as exemplified by Google cars. These vehicles are developed by people recruited outside the automotive industry. Second there is having the best automotive platform, technology supplied by component manufacturers, proving grounds and experience in automotive design as exemplified by more than one traditional car manufacturer. These vehicles are being developed by automotive engineers with long experience of bringing excellent vehicles to market. Third there are fleet owners who see potential in replacing dial-a-ride, city centre to airport only services, taxis and even self-drive vehicles with new technology. They are the most willing to see purely electric vehicles, vehicles without steering wheels and to spread the cost of the technology across many users. They see the point of modifications to the built environment. It makes the roadspace more predictable and supportive of vehicles with no driver. (Underground railway trains can operate without drivers because the environment is so predictable). Less prior knowledge and data processing capacity need be carried onboard if street furniture and gantries exchange data with the vehicles and buildings provide positional information. These vehicles may not need to leave the urban environment. They could could be lighter and a little smaller. Fleet operators would find it easier to recharge electric vehicles than individual owners by rotating them to charging points and choosing times of the day when wholesale electricity was priced at its lowest. Another role of the consultancy is to spot what others miss and to offer an alternative view. This video, a little long and silent but informative, of VisLab's BRAiVE autonomous car, tested on the roads of Parma in July 2013, is notable for two things. Firstly, right at the end, the driver gets out so no one is at the steering wheel as the car completes the final short section in front of the press cameras. This reinforces a point we make elsewhere: there is no necessity for a steering wheel or driver, at least for part of the potential market for autonomous cars. Secondly, about 8 minutes in, the car passes a filling station. This raises ideas about why the potential market might segment and why driverless cars will require changes in the built environment. How will an autonomous vehicle conduct itself in the difficult confines of a filling station? Can a lidar really read which is the right pump? Do not the pumps need to be modified to give visual cues to autonomous cars that use no external communication links? If the car has an internal combustion engine someone will have to get out to fill it if the station has no attendants. The blind man or schoolchild as the sole occupant cannot be expected to do this. So does this mean that the truly driverless car that fleet operators would be attracted to has to be electric? It would appear so. Finally, we disagree with VisLab's contention that autonomous vehicles will mean less cars on the road. We envisage the emergence of many new two car households with perhaps an electric powered, steering wheel-less, driverless car that the children could use by themselves for the school run and an internal combustion (or hybrid) car equipped with driverless technology but also retaining all the trappings of a car used for driving pleasure. The University of Singapore-MIT Alliance for Research and Technology (SMART) recently released this video of a Mitsuibishi car adapted to be driverless using two off the shelf lidars and a computer at a cost of $30,000 with the aim of reducing adaptation costs to $10,000 eventually. It is good to see a small country like Singapore in the development stakes for driverless cars but is adaptation of small internal combustion engined vehicles the right route to take? The adaptation would about double the cost of the vehicle. A vehicle sharing scheme is mooted as the possible use so perhaps it could be. 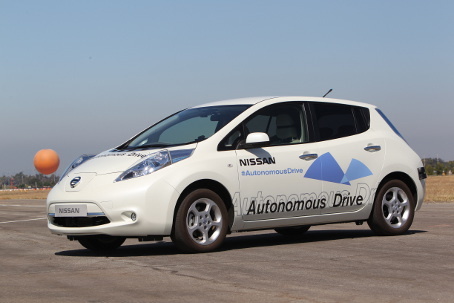 For 2014 Nissan has a new proving ground entirely devoted to autonomous vehicles up and running. It has real buildings not stage set structures. Unlike Google, Nissan Autonomous Drive does not use 3D lidar, prior mapping or external connection. It does not rely on infrastructure. Currently using the all electric Leaf, it is zero emissions and was tested at up to 80kph on a Japanese highway in November. Nissan is committed to making autonomous vehicles commercially available by 2020 and introducing the autonomous technology across the range within two product cycles. No other vehicle manufacturer is so far advanced with the combination of all electric and autonomous drive. The strapline is zero emissions, zero fatalities. Here is a video of Japanese Prime Minister Shinzo Abe taking a ride in an Autonomous Drive car on 9 November 2013. With robotics, academic publications can precede the reality on the road as one researcher builds on the achievements of another. With business models for electric and autonomous vehicles something of the opposite is true. Academic studies follow the reality, they do not lead it, but this tends to be true for business models in most non-mature sectors. If one 'buys in' a model, especially from a different industry, there is far too much that could disrupt it. For example, the majority of the players in autonomous vehicle development are leaning towards having all navigational capabilities onboard and are leaving vehicle-to-vehicle (v-to-v) capabilities till later. A week ago, though, the US Transportation Secretary, Anthony Foxx, said that v-to-v technology could soon be made mandatory and that it could help drivers avoid 70-80% of crashes. A model that inflexibly disregarded v-to-v might then have problems in a major market. This DSRC v-to-v technology is very standards dependent. It works using GPS and wireless with dedicated spectrum with a range of 300-500m. Having nominally looked after the writing of about 2000 European standards (from a British point of view, in the construction sector) in the past I am well aware that open European standards usually take at least five years to write so unless Europe adopted any future American standards faster through the ISO/IEC route it would find itself behind on where it saw itself on v-to-v.
V-to-v does not deliver a driverless outcome - rather it supplies advanced driver aids. It might be extended to include all legacy vehicles, motorcycles, bicycles and pedestrians. The point for now, though, is that most of the business models will have to be left to the practitioners and entrepreneurs as the only groups of people able to move swiftly enough. If regulations emerge they will work out how to accommodate them. Those who have conceptualized the U.S. version of v-to-v technology have in practice also included c-to-v, p-to-v and s-to-v within the grand scheme of things. Potentially, cycles and pedestrians are to carry GPS locators and transmitters - but will they? Toyota, who have one foot clearly in the v-to-v camp, include i-to-v in the mix and so put out a fine conceptual show in terms of intelligent transport systems. Toyota add radar, lane guidance and road surface technology into the package, too, and these of course bring one close to technologies one might have on driverless cars. Can v-to-v deliver everything, though? As part of our research into sightlines for b-to-v we took these two photos at the same junction separated by about three seconds. In fact, a normal street scene with everyone behaving safely. The dog is on a lead and the vehicle is progressing slowly. Would a dog walker always carry a GPS device? 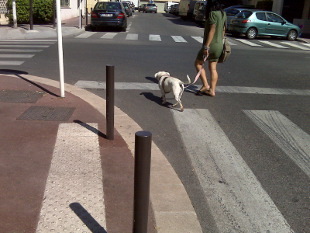 Would a dog? An articulated vehicle like this (pulling three carriages) cannot change lane or decelerate fast. Will all legacy vehicles be retrofitted with v-to-v? Here, b-to-v might be able to warn vehicles of a hazard but not outside a built up area. No company is going to dominate in these technologies for the forseeable future because in the means of communication to vehicles alone there are a growing number of options. [2 June 2014 An objection could be raised that building-to-vehicle communication using LiFi is easier than the reverse, vehicle-to-building, but that fact can also be used to enhance the security of data transfer. At its simplest, only when your car's headlights' LEDs are casting light at the garage door or the drive's gates, where there is a receiving sensor, does the command go out to open these and the other data packets you wish to get transfered to the building are sent (for instance, the latest version of the spreadsheet you have been working on). Because data transmission is limited geographically and in duration it is intrinsically more secure. There is no reason whilst when on the move transmission should not be limited to when a secure receiver, like a modified set of traffic lights, is in sight. Only relatively few receivers will be found on or in each building which is why they must be designed to integrate architecturally]. In concentrating on driverless vehicles we should not overlook progress with purely electric vehicles (EVs). 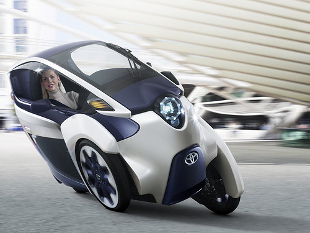 Toyota is going to bring my favourite concept EV, the i-Road, to the City of Grenoble, en masse, at the end 2014 and together with EDF is likely to demonstrate a clever use of electricity and integration of EVs into an urban transport network. Turning to the challengers, Tesla is to build a gigafactory that will built so many lithium ion battery packs that it will halve their cost and double worldwide production. Cells and batteries with capacity of 85GWh will be produced annually. The factory is likely to be somewhere hot like Arizona where the batteries can be charged initially by solar power and wind power, and presumably re-charged if returned to the factory. The number of batteries produced will also allow for storage of significant quantities of electricity by the solar power industry to which some will be sold. Tesla also intends to progressively ramp up production of cars to half a million a year. 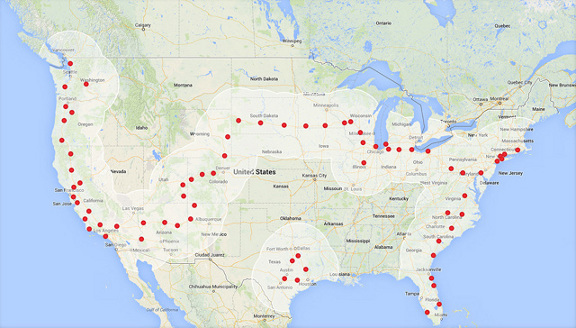 Given range anxiety is a brake on the sale of EVs, Tesla has already established a network of Supercharger stations where a Tesla vehicle can be recharged in 30 minutes. This permits transcontinental travel in the U.S. The good thing about entrepreneurship is that it does not readily let those who say something cannot be done stand in the way. With Toyota and Tesla making the running in the past few weeks, this week it was the turn of government in Britain, central and local, to show it was serious about the new technologies. On Sunday evening the Prime Minister mentioned 5G at a consumer electronics show in Germany, a technology (LiFi) we have been analysing at the consultancy for use with autonomous vehicles (Mercedes has already used it in a limited fashion), especially in relation to building-to-vehicle communications. On Wednesday came news that Transport for London would be getting a version of Paris' Autolib' electric car scheme (perhaps the scheme of its type with the best business model at present) and more electric charging points. So unless technologies stay in their own silos (a bit of a risk) it looks like the new automotive technologies are rolling on a green light. Straying a little from the main subject of driverless cars, I am now a little more confident that standardisation can respond to international incompatibilities in less than five years as the recent recasting of the Vienna Agreement, an agreement that governs, for instance, whether European standard body CEN or international standard body ISO takes the lead, modifies the ground rules. There are already standards like ISO 17263:2012 (which relates to automatic vehicle and equipment identification e.g. automatically identifying the container on a vehicle) that are intended for use with DSRC interfaces, e.g. 5.9 GHz frequency, rather than cellular or satellite systems. The ETSI telecommunications standards body also produces standards on a much more accelerated timescale and has produced some already. DSRC 5.9 GHz is known as ITS-G5 in Europe. 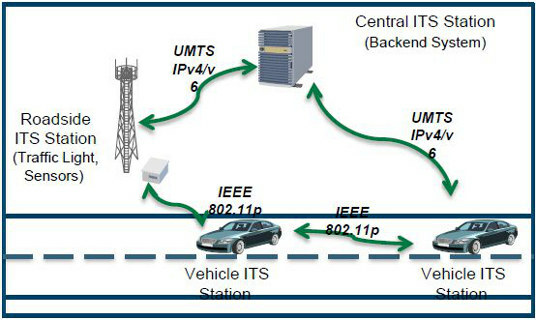 A road corridor between Rotterdam and Vienna using Cooperative Intelligent Transport Systems (C-ITS) based on V2X (or C2X or car2x - much the same thing) communications - meaning here communications between infrastructure and vehicles - will be using ETSI's ITS-G5 (WLANN standard IEEE802.11p) on the 5.9 GHz frequency (in effect local WiFi on a dedicated frequency) or cellular 3G and 4G from 2015. So both new telematics infrastructure and vehicles equipped with the technology to relate to it will first appear in 2015 - but it will take some time before these technologies converge with onboard driverless cars technologies. Very rapid data exchange is necessary if it is used for navigation on the highway. 3G has a latency problem, 4G can be low latency but requires cellular operators to give vehicle related traffic priority, 5.9 GHz is low latency. The range of ITS-G5, up to 800m, would give vehicles a extended 'view' forward relative to lidar and radar and the ability to know what is round corners or otherwise unseen and communicate with infrastructure. Nonetheless, all-onboard driverless navigation technology would appear to reduce road accidents more than ITS. Toyota is working on collaborative measures and advanced driving support systems not dissimilar to the Cooperative Intelligent Transport Systems being developed in Europe. They use front facing millimetre wave radar, onboard cameras and maps, cooperative cruise control through v-to-v, and are described in this video. They do not replace the driver and there is no lidar but they do use automated technologies in many driving situations. Lane trace control, for instance, uses automated steering control based on current technologies. These leave quite a lot of potential for later convergence with driverless technologies. If the technology were available but more expensive where would you consider using LiFi now for position fixing and communications? In a deep mine for a start where you would not get a GPS signal and unreliable radio communications. The LEDs could provide light, too. Reflected light can carry the data signal so where a wall of rock might block a radio signal the slightest opening might let the light through. Automated vehicles using lasers will soon be doing mining and whilst we have been looking in awe at the half a million and more miles self-driving Google cars have driven, 2.3 million kilometres have been covered by driverless haul trucks in mining environments. [How LiFi might be used in the more predictable context of an office: link to illustration]. 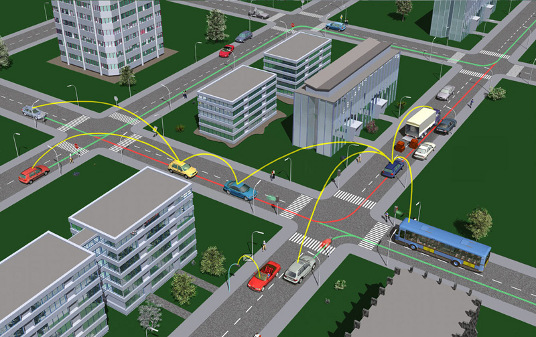 The CAR 2 CAR Communications Consortium (C2C CC) is the principal organisation co-ordinating technical input for developing standards for co-operative intelligent transport systems (C-ITS) in Europe. It aims to increase transport safety and efficiency by means of C-ITS. This it will do by, amongst other things, developing open European standards in ETSI and CEN and charting a course for the deployment of C-ITS which uses V2V and V2I technologies. For the past two weeks members of the European standards body CEN have been considering whether it should co-operate with American standards body ANSI on driverless technology standards. If V2V and V2I technologies become mandatory for all new vehicles then driverless vehicles will have to them too and there would be scope for how navigation is controlled to conflict as between C-ITS and driverless technologies. In addition, standardisation can slow up the rate of innovation which developers of autonomous technologies would not want to see. A mandate from the European Commission has been used to develop a set of standards in ETSI and CEN that give effect to C-ITS and the vehicle manufacturers within C2C CC have committed to introduce C-ITS from 2015. It is a legitimate commercial decision for vehicle manufacturers to make as to whether in the first instance they prefer to go for V2V, driverless technologies or await whichever technologies can be bought off the shelf from component suppliers and some dislike the prospect of any legislative dictat as to what they adopt. C2C CC sees C-ITS offering advanced driver assistance, increased traffic efficiency and communication and information services. 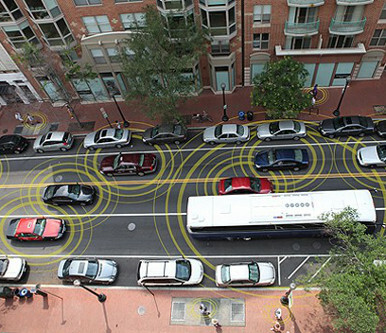 The infrastructure will communicate with vehicles using WLAN on the 5.9GHz band of frequencies so both the infrastructure and each vehicle will serve as a WLAN stations meaning that vehicles can pass forward information to other vehicles within range. Driverless vehicles, by using lidar, optical cameras and, if desired, radar and infrared, too, would be able to identify most of the hazards identified by C-ITS on their own, add some more and also provide superior navigation and safety capabilities to human drivers. What the large majority of driverless car videos do not usually show to date is the car driving itself without passengers. This 2014 Audi A7 video is going to start a trend of cinematography which will be a boon to detective drama film-makers. Now as the good cop gets distracted by something in the car park and opens fire on it, it does not have to be something improbable like a door swinging in the wind but it can be a driverless car moving off to a rendezvous. Some have already called it 'ghost driving'. Much more scary for the viewer. Here it is called 'piloted parking' when really there is no human pilot. This parking takes place entirely on private land, though, so it could be a technology available soon in private car parks with the right sensor at the entrance. This is because there is requirement for a driver to be at the wheel on the public highway in most U.S. states and in EU countries with the notable exception of the U.K. and Spain. A car parking itself in a private car park is not on the public highway. The requirement to have the driver at the wheel nowadays really only offers the type of assurance that having a man carrying a red flag in front of a motor vehicle did more than a century before. Volvo also demonstrates autonomous parking and, more importantly, self-driving on the roads of Gothenberg in a video released today. Google has now done 700,000 miles in its self-driving cars. This newly released video demonstrates some concepts relating to onboard prior knowledge, standardised responses and machine learning. How the cars address some well-known hazards - road works, railway crossings, lane obstructions, pedestrians at junctions and cyclists - in a safe manner is shown. Getting a car to go round a circuit autonomously is not one of the most complex tasks that faces researchers as the machine learning involved can be kept within reasonable bounds and there is not too much that is unpredictable. As Jeremy Clarkson has been so much in the news in the past few days, here is a clip of him being taken for a ride in a BMW 330i in 2011. Europe: Mercedes, Volvo, VW Audi Group, BMW, Continental, Valeo. The telecoms industry and the data processing industry will also be large players once the cars achieve volume sales. The lists are not exhaustive and the technologies overlap in capabilities so considerable scope exists for market choice. Will there be a losing form of road transport with the advent of driverless cars? Not cars. There will be more of them but using less total roadspace. Not buses or guided buses. The answer would, at a guess, be trams. 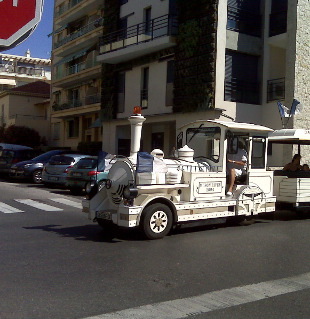 These are like trains on the roads but with next to no ability to change course and requiring constant driver vigilance. Driverless cars, and larger vehicles moving together as roadtrains, reduce or remove the workload on drivers and have very much more inherent flexibility. They will be safer. Google is probably the leader in developing digital maps for road navigation but European ITS will need maps too and there is a proposal before one of the European standards bodies to develop a Technical Specification for what is being called a spatial data exchange framework. It builds on preliminary work undertaken by the EU funded ROSATTE project. It is important that digital maps for ITS are highly up to date for attributes and geometry that are critical in terms of safety and efficiency. The map providers cannot easily keep their maps up to date for such attributes, while up-to-date maps are a key asset for a wide range of ITS applications in the areas of navigation, driver assistance, cooperative driving and automated driving. The solution is to retrieve the information on changes from the road authorities. As they create the changes, they are the most efficient and immediate source for such information. This imposes considerable duties on road authorities in a budget constrained period and driverless technologies that provide the same or greater levels of safety whilst keeping all navigational capabilities onboard, including updating their onboard prior knowledge, on the face of it have a competitive advantage, including in terms of time, though not necessarily in terms of capital cost. (A driverless car like the Nissan Autonomous Drive vehicle might cost more to buy but impose less costs on road authorities than ITS equipped vehicles). Driverless technologies that leverage network connectivity, as might the Google cars, would be able to dynamically update each others maps. 3) Driverless technology with network assisted onboard navigational capability. So at last Worldreviews is to get what it has been pushing for. Google is to build 200 two-seater driverless cars without steering wheels in Detroit for use near its HQ in Mountain View, California. They will not have brake pedals or accelerator pedals either, only a stop-start button. Were Google's intention with its latest car to displace traditional vehicle manufacturers it would be on a sticky wicket. Rather we suspect that Google shares Worldreviews' view that there is a new car-travelling demographic to be reached. Its video suggests as much: mothers with children that need attending to, the old, the blind, the disabled and those wanting to travel in a space saving vehicle. Like a lot of disruptive technology, it does not initially exceed the capabilities of preceding technology but is good enough and with the potential to be quite a lot cheaper. At Worldreviews, we do not think that the autonomous technologies will reach their full potential without modifications to the built environment. The streets of Mountain View are not the ideal testing place for speed limited vehicles (maximum speed 25mph) with lesser crash resistance than some larger vehicles but it is probably the best available being close to Google HQ. As we said last year excess development money should go into crash resistance. F1 cockpits are tiny but have immense structural integrity. Likewise the broad pedestrian pavements of Milton Keynes may not be the ideal testing place for autonomous technology pods but nonetheless probably the best available in the UK. We would urge the UK authorities to press ahead with finding locations where other types of autonomous vehicles can be trialled with light modifications to the infrastructure and the built environment. The shape of this market may well be defined by those who get the best visions trialled early. The appearance soon of vehicles without steering wheels in Mountain View and Milton Keynes will be an immense step forward in gaining acceptance for driverless cars and will bring about a realisation that they are safe and could eliminate 90% of road accidents. To do this the physical environment in which they operate may need to be modified. The Google cars in Mountain View will be dependant on Google maps supplemented by very precise information gathered by the lidars and other information gathering equipment of the previous generation of driverless cars and the further data that will come from this new generation of cars. Google and a few others have a genuine head start in maps. Other manufacturers may lean towards advanced machine learning. In the Volvo trial in Gothenberg updated maps are supplied by radio link from Volvo HQ. At Worldreviews we are in favour of a concept of our own which we are calling local cue maps supplied by the infrastructure to passing driverless cars. It avoids the necessity of one organisation mapping the whole world or at least a whole country and third party providers could maps for different locations. It also avoids the necessity of having a great deal of onboard machine learning capability.